As Opel paint is known for being delicate and wanting it to last as long as possible I took the balances and bought some car detailing products to avoid paint damage when washing the car. Whooa... looks like things will be properly taken care of! Can you please specify the products to make the topic as detailed as possible. What is this round plastic object behind the greenish brush? Astra Options: Loads more than I need. Not sure but it looks very much like a "Grit Guard" for the bucket. As you wash your mitt, the grit should come off and fall through the holes in the guard so it doesn't get picked up next time you rinse the mitt. Reading that back it sounds a bit rude, does anyone on here often get grit on their mitt.? The products are mostly from Chemical Guys. I took some promotions on amazon and on their site and I ended up making an investment to be able to wash the car without worries. 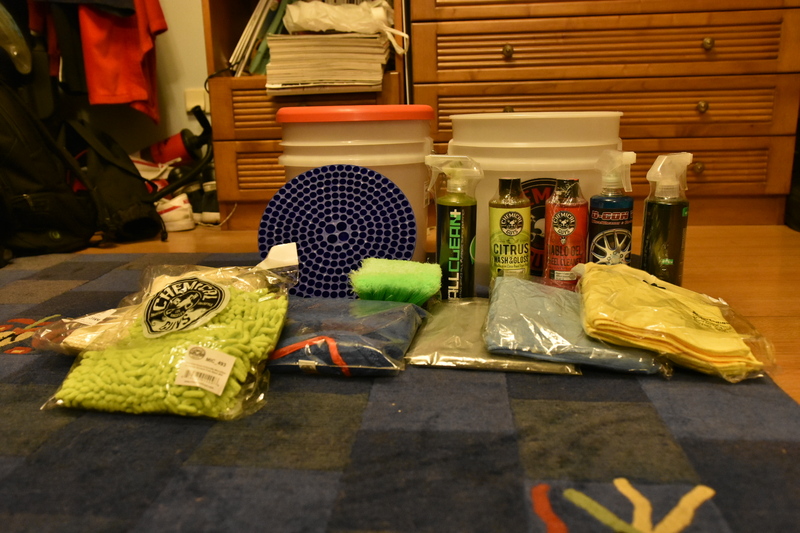 And then I still need to get CHEMICAL GUYS COLORLESS ODORLESS LEATHER CLEANER and CHEMICAL GUYS LEATHER CONDITIONER for the treatment of the hides in the interior and more microfiber towels. Microfiber towels are never too much. Looks like you'll be busy for the next few days at least. Unfortunately the forecasts point to rain next weekend. I hope that the meteorologists are mistaken and that at least next Sunday does not rain so that I can wash the car. The A4 of my girlfriend's parents also needs to be washed and well washed, both exterior and interior. And I believe it is the car that will notice the differences between before and after. Hey Costa, have you considered buying the Chemical Guys Carnauba paste wax? If so - any thoughts to share? I wonder if anyone tried it out yet? I was looking into this or maybe even going ahead with a glass/ceramic coating. Looking forward to seeing an Astra coated. I have not yet bought any wax or claybar because I am waiting for the good time to do this type of treatment. As I will apply a ceramic protection in the car in April / May may not even get to buy the wax, because the company that will do the service before applying the protection cleans the paint. What do you reccon - ceramic coat will be the better option? I wonder - do you need to strip it in a year or so before reapplying the coating again? If so, I think the better option is to have the wax instead, as it wears off in few months and the treatment is simpler (not that demanding). I found it hard to believe at the time, but when I collected my new ST a few weeks ago, the dealership told me they had applied ceramic coating although I'd turned down the option when I ordered the car. Having read a little bit about ceramic coating since then, in general, and if applied correctly, the coating should last for about 18 months. I also asked on the Detailing World forum how to maintain the coating and the main replies from a couple of manufacturers was simply wash and dry but not apply anything else over the top of the coating.